The Bolton Conservation Trust, the Conservation Commission, and the Trails Committee would like to thank all those who have cleared, maintained, and cared for our trails and conservation lands, helping to keep them open and accessible to everyone. Bolton’s trails weave through our community, and offer us all a place to pursue any number of outdoor activities. 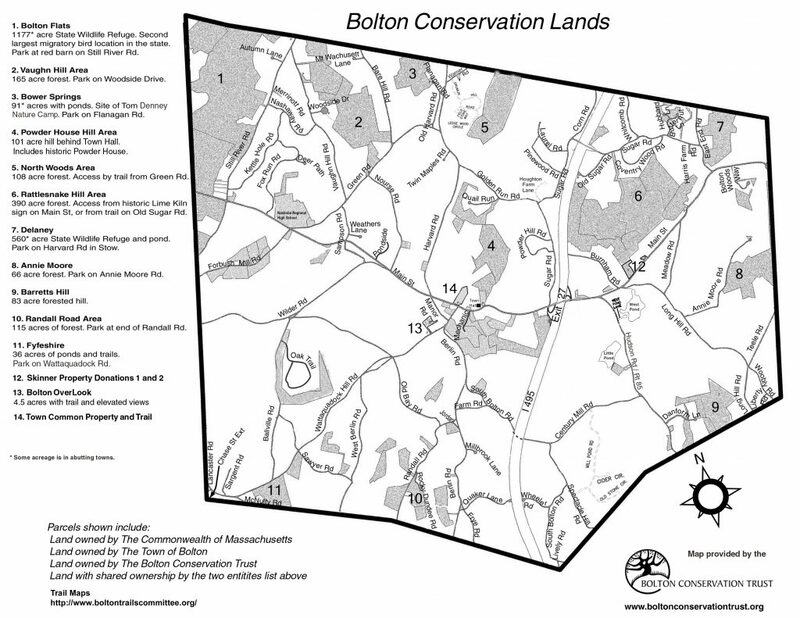 Most of the town’s trails are on public conservation lands, many of which have been acquired through the generous donations of Bolton citizens. Numerous trails do traverse some portion of private land, however, and we are grateful to those landowners who generously share their properties through trail easements and informal trail crossings. Specific information and trail maps can be found on this site by searching the drop down menu for each property name or by clicking on the names uder this map. Click on this map for a larger version. Detailed maps are listed below this one. *portion of total acreage is outside Bolton.